William (Bill) Augustus Collins, Q.C. Passed peacefully away in the presence of his loving family at St. Patrick’s Mercy Home on November 21, 2018. Predeceased by his parents Bernard and Kathleen Collins; Brother John Collins, and Father-in-law Allan Healey. Leaving to mourn with loving memories his devoted wife of 42 years, Christine Collins; his sons Jonathan (Ashley) Collins, and Michael (Robin) Collins; his grandchildren Grace Collins, Benjamin Collins, and Lucy Collins; Brothers Bernard/Tanny (Liz) Collins, Brian (Janet) Collins, Andrew (Shirley) Collins; Mother-in-law Clara Healey; Brothers-in-law Tony (Alma) Healey, and Terry (Jane) Healey; Sister-in-law Carolann (Sean) Fleming. Also numerous nieces and nephews, and a large circle of friends and family. As the first boy to grow up on the first house on First Avenue, Bill was a charmer from his earliest days. The big brother of four boys, he breezed through school at St. Bon’s and one (inaugural) year at Brother Rice, and many years of weeks-long scout camps. University on the mainland was the scene of more rigorous studies, but also development of his work-hard play-hard approach to life. A St. Francis Xavier and Dalhousie Law grad, Bill stood first in front of a judge in 1972; many greatly admired him. A Supreme Court Justice described him as the best ever seen in front of a jury. A person’s dignity was always at the heart of his professional life; he was an early volunteer leader in the community, led Newfoundland and Labrador Human Rights Association and later as the Commissioner with the Canadian Human Rights Commission. Bill fought hard, while fair, to right wrongs. His clients ranged from those wrongly convicted of murder, to those making creative use of a stolen backhoe. His efforts as a lawyer and advisor helped bring equality and equity to the Inuit of Labrador. The biggest part of his generous heart was saved for family. He was lucky in love. Marriage brought organization and direction while maintaining and building a circle of friends that enjoy life. His two sons became a new focus of his attention and caring. Coaching youth sport teams became a skill added to his repertoire. Yet another was cooking. An invitation to a dinner party at First Avenue or the cabin in Marysvale was a choice event. Later years brought grandchildren to his life, with whom laughter was a two-way street. The last six months of Bill’s life was one of constant care at the Health Sciences Centre and St. Patrick’s Mercy Home. The Collins Family wishes to thank the nurses, doctors, and all the other staff that brought compassionate attention to Bill every day. Cremation has taken place. Resting at Carnell’s Funeral Home, 329 Freshwater Road from 7 – 9 pm on Saturday, November 24, 2018 and from 2 – 4 and 7 – 9 pm on Sunday, November 25, 2018. Funeral service will be held on Monday, November 26, 2018 at 9:30 am from St. Pius X, with inurnment at Holy Sepulchre Cemetery. 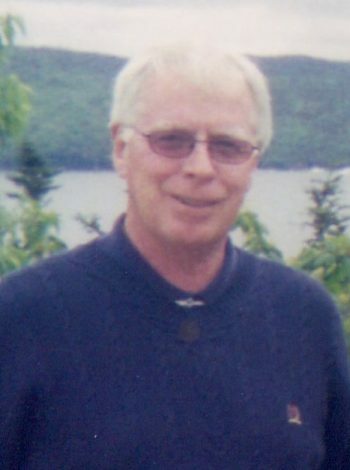 In lieu of flowers, donations in Bill’s memory may be to the Alzheimer’s Society of Canada. You will be sadly missed by all. S.orry to hear of Bills passing. He represented me a few times and I was very greatfull. He will be missed. Sometimes you meet someone for the first time and realize , you just met the complete person ,you can see it in their smile ,in their words and in their actions, Bill was that way , a true testament ,of a gentleman,so fortunate I met him. I first met Bill when our sons played together in peewee minor baseball. We agreed to coach the team that year and we continued to coach together a couple of years after our kids stopped playing. It was great fun!! Minor baseball teams were made up fairly equally. All the teams had a couple of kids who could hit well or pitch well. And all had a few decent fielders. But Bill and I realized that most plays were the result of errors, and we were not going to win many games competing on hitting, pitching or fielding only . Our plan was based on the fact that all kids love to run as fast as they can. So we coached the running game. When a kid got on base with a walk (often) or a fielding error (also often) or an actual hit (not so often), it was our plan to do everything possible to get him home. Everything. Stealing played a great role in our plan. Our kids always stole second, usually successfully. Then third. Our most rewarding play was when there were kids on first and third with 0 or1out. Kid on first steals second on the very first pitch. Catcher throws to second, usually late or missing. Meanwhile the kid on third steals home. Run scores. Worked every time and we usually got a couple of runs a game that way. We won the league championship in our second year coaching together. I got the picture to prove it. Our plan was to use the running game to get the runner home. I thought of this as soon as I saw Bill’s obit in the paper. Whatever his definition of home is, I hope he’s there now. So sorry to read the news of your brother’s passing. Our sincere sympathy in a difficult time. Derek & Brenda at #4. Please accept my condolences on the passing of a devoted husband and proud father. Mr. Bill Collins shared many months of the Raymond Wolfe Preliminary with me in Stephenville. The wintery days with wind and snow and a trip from St. John’s never prevented his prompt attendance. His courtesy and thoughtful consideration of Mr. Wolfe has remained with me these many years. Bill’s courtesy was as characteristic of him as were his legal skills ….. which always shone. He cared for all those he encountered. May Bill’s never ending smile bring satisfaction to others in his new life! I am away but my thoughts are with you…a difficult time for you all. Take care of each other and your memories. My sincerest condolences on Bill’s passing.. We were grade 1 to11 classmates as well as members of the 1st St. John’s Boy Scouts. What a whirlwind of memories. Coincidentally we ended up in law together. Bill was an outstanding lawyer going the extra mile for clients that many had written off. In retirement our classmates reconnected on weekly hikes.. We shared many happy reminiscences of our childhood days until Bill could no longer participate. Unfortunately I am out of the province and unable to attend funeral services. May God bless your family at this difficult time. My sincerest condolences on Bill’s passing. We were classmates from grades1 – 11 as well as members of the 1st. St. John’s Boy Scouts. What a whirlwin of happy memories. Coincidently both Bill and I ended up in law. Bill was a great defense lawyer who went the extra mile for clients that many had written off. Upon retirement we reconnected on our weekly class hikes. Many more happy times and remincences of our childhood escapades together until Bill could no longer participate. Unfortunately I am out of province and will not be able to attend funeral services. A fond farewell to Bill. Tanny and family. We were saddened to learn of your brother Bill’s passing . Condolences to you and all your loved ones. So sorry to hear of Bill’s death. May you and all of his loved ones find comfort in your memories of him. Dear Chris. I was so sorry to learn of Bill’s passing. Have been remembering some of the good times we all shared over the years. Bruce and I send heartfelt condolences to you and the boys and to all the Collins family. God bless you. Will be in touch. Rest in eternal peace Bill. We are so sorry to learn of Bill’s passing.He was a truly good guy and will be missed.Please accept our heart felt condolences. So sorry to learn of Bill’s passing. Your family is in our hearts and prayers at this difficult period. God Bless. We were saddened to learn of Bill’s passing. Our memories of Bill go back to school days and scouting. Our prayers and condolence are for the entire Collins Family. God bless! So sorry to hear of Bill’s passing. Although we did not know Bill as well as we did his 3 brothers, I do recall his charming sense of humour and easy disposition. I am sure he will be greatly missed. Marie and I extend our most sincere condolences to the Collins family. My deepest condolences. Bill was a real gentleman and a fine, caring person. He will be dearly missed, but fondly remembered. Our deepest condolences and Prayers to Bill’s immediate Family and Friends. We have known Bill back over the many years that seem to have passed so quickly. He was such a Fine and Gentle Person. Always with a happy welcome and smile,… and had that wonderful quality of the need to help those who really required help. He will be sadly missed by many. Gone but never forgotten. Remember too, that one day we all will be joined with our Family and Friends once again, in the harmony of togetherness that will be for eternity. Until then Bill, looking forward to seeing you on the other side when our life ends here. RIP…. Sorry to hear of Bill’s passing. My condolences to the family. Sorry to hear of Bill’s passing. We are so sorry to hear of your brother’s passing. Our thoughts and prayers are with you at this very sad time. May he RIP. We are so heartbroken to hear of Bill’s passing We have enjoyed some wonderful days together over the years Our family sends their deepest sympathies at this sad time. We will remember all the good times forever. Unfortunately we are not able to be there in person but know that all of you are in our thoughts and prayers Hugs, Andre, Luisa & family. Tanny, sorry to hear of Bill’s passing.My condolences to you and Bill’s family. Andrew, Brian, Tanny and families. So sorry to hear of Bills passing. He was one of the most well respected and finest lawyers this province has ever seen and he was a wonderful human being. Will keep you all in my thoughts as you go through this difficult time. As a young Police Officer in 19070 I remember facing Bill in court. He had a way of going hard on you in an easy way! We would face each other several times over the years! He never changed! He soon earned my respect! Going into court I looked forward to seeing that big smile on his face, a face of pure confidence! R I P Bill Collins! Having been Bill’s Legal Assistant for 19 years, I could write a book. There was never a dull moment around the office. If there was an interesting Court case, we would be there just to watch him in action. Sending my deepest sympathy to Christine and her family, Bill will be missed by many. As I sit here next to his office, I can still hear him say ‘take a letter….today’s date’. RIP Bill from ‘dettie’. Brian, Debbie and William MacLeod will cherish many fond memories with Bill in Newfoundland and in Florida. Art collection tours, heated discussions around the fire, walks to the lake, sharing his latest favorite book, many delicious meals, and wonderful family reunions. He will be missed! In my early years as a Legal Assistant, Bill was my mentor, my Guru, and certainly my friend. It was a privilege and an honor to have worked with him. Words cannot express heartfelt sorrow. Sincere condolences to Chris, Jon, Michael and your families and friends. May you find comfort in each other in this difficult time. Rest in peace Bill, you will be greatly missed but never forgotten. It has been a different feeling at the office this last couple days and will be for a long time to come. I started my career with Bill as my principal when I articled. I learned a lot from him then and in the over 15 years thereafter before he retired. For all of that I am truly in is debt and he in my memory. I have always worked in the office next to Bill’s and still do today. We still refer to it as “Bill’s office”, even in passing and that is not going to change. It will, however, take on additional meaning every time in future. It is so easy to see Bill behind that desk every time I pass the open door – disclosure in one hand, highlighter in the other. A person who is not forgotten never truly dies. In this office and we are sure in many other places and people, Bill is very much alive. To you Christine and to Jonathan and Michael and your families we are thinking of you and praying for you. May the peace in which Bill now rests envelop and support you all. I was very saddened to hear of the loss of your dear husband Christine. I always thought Bill was a devoted family man who loved to cook. I did have the pleasure of sampling a gourmet meal at an office party you guys had at your house for all of us. I can see him smiling now, as he always had a smile for me when I worked for him at Collins & Associates Law Firm. He will be dearly missed. My thoughts and prayers are with you and your boys during this difficult time. So sorry to hear of Bills passing. My thoughts and prayers are with you. I am so saddened to hear of this news, and my sincerest condolences to Christine, and all the family. Having known Bill since the beginning of my career, I found him to be an example of the best in advocacy and civility amongst the Bar. A perfect gentleman, a generous mentor, and a most able barrister. This is a keen loss to the legal community and his family. May he rest peacefully. To the Collins family, My condolences on the passing of Bill. The association with Bill and the brothers goes from St. Bon’s, Gonzaga and St. F.X. with fond memories! Sorry I can’t be there! God bless him and the family in this time of loss! I just read this sad news of Bill’s passing. Unfortunately I am away, and will be unable to attend the wake and express my condolences in person. The obituary was lovely and described Bill perfectly. He was a kind soul, an outstanding lawyer, a dear friend to many, and great family man. He was respected by all who knew him for these and other outstanding qualities. Please accept my sincere condolences as we say good-bye to this lovely man. We heard about Bill’s passing and wanted to offer our condolences. We will be thinking of you during this very difficult time. I hope you and the family will spend much time remembering the good times spent with Bill. Sorry to hear about your loss, Jonathan. My condolences to you and the whole family. Bill and I were classmates at Dal Law School, we soon thereafter shared family connections when Tanny marrid my sister Liz, and although our practices never brought us together, I admired his legal tenacity whenever he was in the court’s limelight, which was often. I last saw Bill shine at a Legal Aid Board meeting when, although his health challenges were obviously starting, he rose to the occasion and explained a complex legal issue skilfully to a legal aid client. Bill was still impressive. While his passing obviously brings you immediate sadness, Bill’s life was full and worthwhile, so hopefully time will allow the immediate wounds to heal and good memories prevail. I am sorry that the miles between us and the inclement weather make it imposinle for me to bring these thoughts personally. We will be thinking of you all at this difficult time. Sincere condolences to Bill’s family and friends from Reg and Chris Collins’ family from Placentia. Bill spent time at our house, many years ago when he had court in Placentia. A true Gentleman. Always a smile and a story to tell. An enormous loss for his family and the legal community. Christine & family my condolences on the loss of Bill.. I first met Bill at Dal Law School. We were called to the bar together and remained friends throughout. I first met Bill when I began practicing law in Newfoundland in 1991. He was very senior in the profession to me then, but always had time to offer good advice to someone starting out. Over the years I found Bill was an intelligent compassionate and caring guy and it beamed off him. He always had interesting conversation and good tips to fellow lawyers which he shared generously. I will miss him and I am sure I am not alone. Cristine and family so sorry for your loss. May he rest in peace. Christine and family, So very sorry for your loss. May he Rest In Peace. Christine & family, please accept our heartfelt condolences upon Bill’s passing. I had the chance to meet Bill on a few occasions & my parents have spoken on how helpful he was to them. I remember him as always having a ready smile & a quick wit. We wish you much peace & comfort at this time. God bless. Christine and family I am sorry for your loss. I have fond memories of you and Bill from many years ago and my thoughts are with you. I was shocked as he seemed unstoppable. He was a good man and did many good things. May time lessen your sorrow. We were classmates in the Dalhousie Law School class of 1971 . Both in Law School and throughout his legal career Bill was an all star performer . He was a stellar performer in the Courtroom and his clients always received outstanding representation. Bill had many friends and his life was well spent. The last few years have been difficult but he received great support and care from his family. He will live on the hearts and minds of his family and multitude of friends. He is now at rest – may that rest be in peace. Sincere condolences to all whom he is endeared . So sorry Jonathan. I know how hard this can be. Lean on your family for help – they need you as much as you need them right now. Take care. I was saddened to learn of Bill’s passing. We were very good friends for many years. Bill was wonderful company in private, and a force to be reckoned with in the courtroom. He was altogether the most decent of gentlemen. I will miss him, and I send my sincere condolences to those who loved him.